The latest versions of Internet Explorer introduced quite a few features when it comes to extending the web browser's core capabilities (things like "accelerators" and custom search providers), and the ability to use multiple search engines from within Internet Explorer itself, by changing your default search provider, or switch on-the-fly from one search engine to the other. And Internet Explorer now also includes a detection mechanism for some websites or web pages that are recognized as search providers. 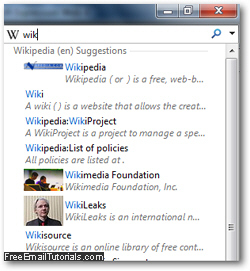 One such example is Wikipedia, and this tutorial shows you how to add Wikipedia search directly to Internet Explorer. Start by opening Internet Explorer if it is not already running; then go to any page on Wikipedia, past the landing page. Here is a sample link of a page on the Wikipedia website (opens in a new window - make sure to open it in Internet Explorer). If you click on "Wikipedia (en)" in the dropdown menu ("en" stands for "English", i.e., the English version of Wikipedia), Internet Explorer will temporarily add it as your search engine for the text box in the top right corner, but without changing your default search engine settings: notice that Wikipedia is now visible inside the search box. 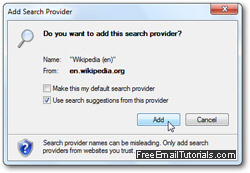 If you want to make Wikipedia permanently available as search provider, and just for this browsing sessions (until you close Internet Explorer), click again on the dropdown menu, select the "Add Search Providers" submenu, and click on "Wikipedia (en)". If you just want Wikipedia to be available as an Internet Explorer search provider from the dropdown menu, click on the "Add" button. 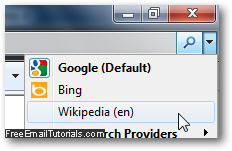 ...And this is how easily you can add Wikipedia search to Internet Explorer 8 / IE 7!